Free cursive handwriting worksheet with lowercase small letters ( 26 alphabet letters ) in printable format. Print our free cursive alphabet tracing worksheet with dotted lines in pdf printable format with A-Z cursive letters and practise your handwriting skills. Cursive Lowercase A-Z alphabet letters for handwriting practise. With this worksheet you can practise your cursive letter handwriting skills by writing small lowercase letters. This worksheet contains small letters with dotted lines in cursive format. Suitable for kindergarten kids, home use and classroom. 1 handwriting worksheet with letters A-Z. Printable PDF ( A4 ). Print this free lowercase cursive letter worksheet with alphabets A to Z below. 1 worksheet with 26 small alphabet letters in cursive. Click the "Download" link below the worksheet thumbnail to download this worksheet in PDF. You can preview your printable PDF worksheet with lowercase cursive letters in the new window. You can print the PDF document online via your browsers print function. You may also choose to download and save this lowercase cursive letter PDF worksheet on your computer to print out at a later time. Previewing our free printable A-Z worksheet to practise cursive handwriting ( with small lowercase letters and dotted lines ) suitable for kindergarten kids. A to Z letters. 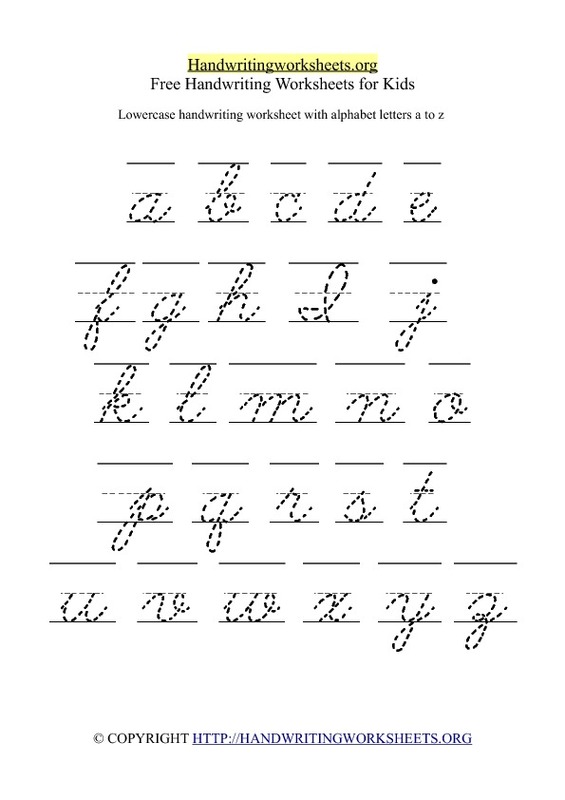 Download our free lowercase cursive handwriting worksheet with dotted lines. Free worksheet for cursive handwriting practise and training in PDF format.